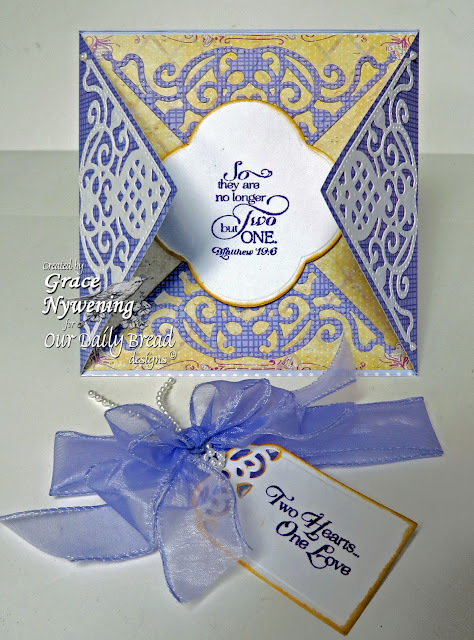 Th-INK-ing of You: Fancy Wedding Card and mini-tutorial! As you can see... there's one larger corner with a heart theme. There is also a smaller corner die with a cross theme. I love them both!!! So today I wanted to share one idea for the larger heart die! 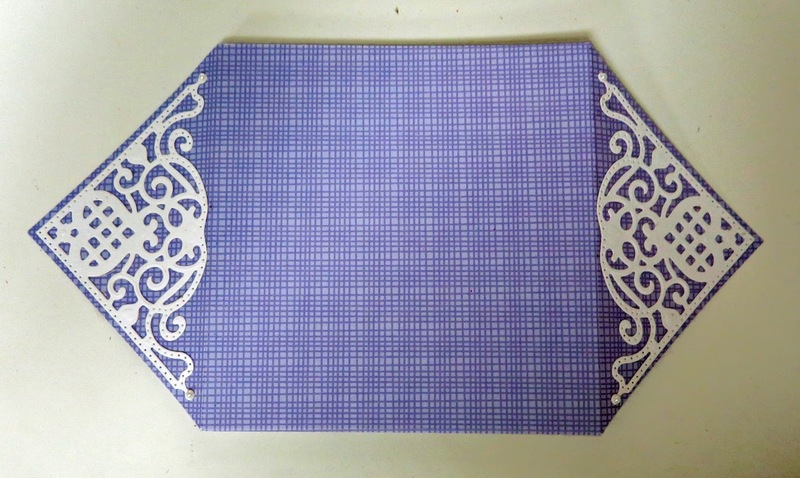 I cut and embossed two corner die cuts from white, and two from my lavender design paper, which is from an older Heidi Grace pad. I cut my lavender designer paper 5 3/4" x 11 1/4". I scored along the long side at 2 7/8" and 8 3/8". After scoring and folding the two outside panels inward, it leaves a center card approximately 5 5/8" wide (the extra 1/8" is taken up in the folds). I then positioned my ruler on the mid-point on my side panels, and penciled a line from that mid-point to the fold line at the outside edges of the center square. I cut away the triangles that were penciled in, leaving me with two triangle panels that wrap around my card. I positioned the two white corner dies on each of these triangles. This is what you have after cutting your triangles and adhering the white die cuts. On the inside of the card, I cut a yellow piece of design paper from a Prima pad, and adhered it to the inside of the double sided lavender paper. 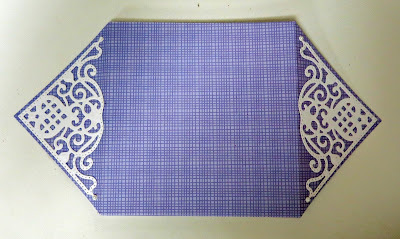 I then added the two lavender corner dies I had cut to form a pretty mat for my setiment panel. 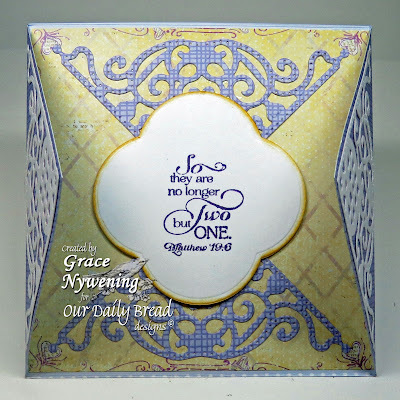 The sentiment panel is the ODBD Custom Quatrefoil Design Die, and I stamped the verse from the Love Scriptures stamp set with Dusty Concord T Holtz Ink. I sponged the edges of this panel with Scattered Straw ink and popped it up on thin dimensionals. I then created a belly band to keep the card closed and make a pretty presentation. I used sheer lavender ribbon from Michael's and made a band and bow. I tied on a tag with a sentiment from To The Love Birds, and cut it with the large tag from the Recipe Card and Tags Die set. This easily slips off yet is snug enough to keep the card closed. Thanks so much for stopping by! I love knowing you were here! It truly makes my day! Grace this is beautiful - love your colours and the way you have used the dies. This is such a beautiful card- lovely design and colors! Gorgeous card, Grace! I love the color combo and the beautiful diecuts! Wonderful design! 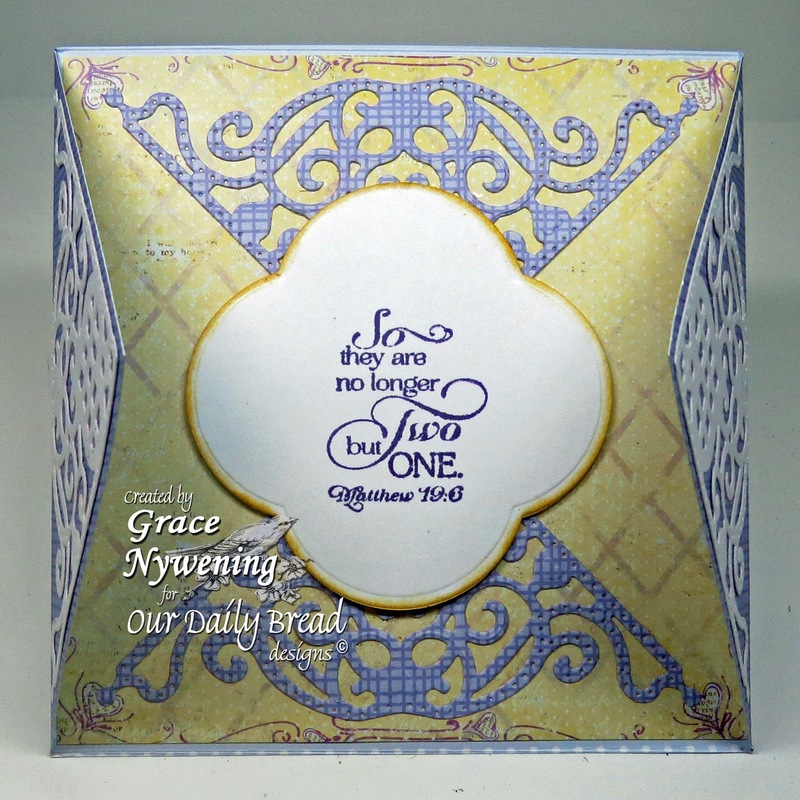 Simply lovely and more wonderful dies for my wish list! Beautiful Grace!! 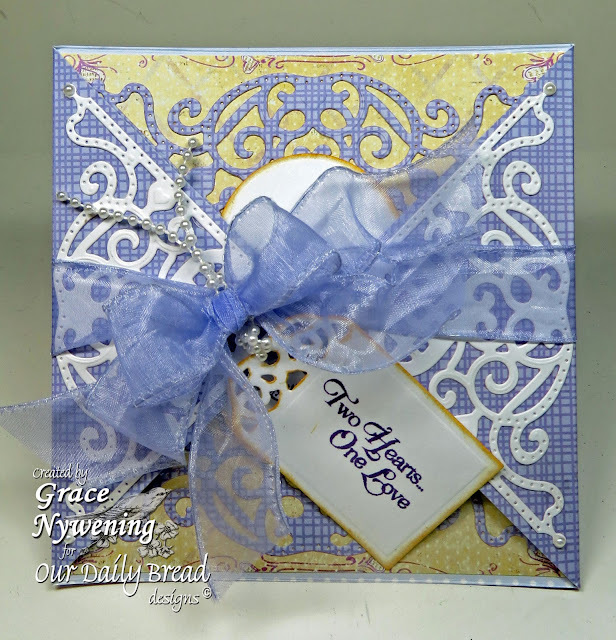 I love the blues and yellows,design and your beautiful sheer bow!! Stunning! !Have a great day! !